Butterflies are probably the most popular insects ever! But what about moths? What’s their story? Why are they less popular than butterflies, considering the fact that there are nearly 250,000 species of them compared to only about 20,000 species of butterflies? This is one fact among a plethora of others that I’m sure you all would like to know about moths! The question we get asked the most here at the CBC is what is the difference between butterflies and moths? It can be a little tricky to explain. They are two completely different types of insects. However, the characteristics that define them are not always so clear-cut. For example, butterflies are diurnal, meaning that they fly during the day. Most moths are nocturnal, but some can be crepuscular (meaning they fly at dawn and dusk) and some are even diurnal. Butterflies and moths can both have thin antennae, but only moths have feathery antennae. Butterflies have thinner bodies with less hair while moths are chunky and hairy! Although, I have seen some stalky butterflies, and hairy ones too. Butterflies tend to be bright and colorful, whereas moths are normally cryptic and drab. But what is thought to be the most beautiful lepidopteran in the world is actually, a moth. So sometimes, you need to take a second or third look to determine which one it is. As different as they are, they are similar in many fundamental ways. They both have scales covering their wings, they feed on flower nectar with a proboscis, and they have complete metamorphosis that includes a larva, pupa, and adult stage. These life stages are given specific names. The larva of both are known as caterpillars and the pupa is called a chrysalis. Some moths build a silk covering around their chrysalis for protection. This is known as a cocoon, and despite what some people think, butterflies do not make cocoons. Moths do get some recognition, unfortunately, it’s not all good. Several moths are serious pests in gardens, in forests, on farms, and even on clothes and in stored grains! If you have tomatoes, you may be familiar with the tomato hornworm. This is a huge and beautiful caterpillar but it has a very big appetite that most people don’t appreciate! It is a member of the Sphingidae, or sphinx moth family. These moths are often large and impressive, making them one of the most popular families. The caterpillars can be pesky, but can be deterred by planting marigolds around your tomato plants. The Gypsy Moth is another famous caterpillar that has caused a lot of problems. They originated in Europe and Asia but were introduced to the United States in the 1800s. Since their arrival, they have defoliated millions of acres of forest. Although they are better controlled now, they continue to be a major pest of hardwood trees. We all remember the smell of moth balls in our grandma’s closet. We can thank the common clothes moth for that wonderful smell! The caterpillars of these tiny moths are big fans of natural, proteinaceous fibers such as silk and wool. Luckily, they will not eat artificial fibers, so a lot of our clothes are safe now. So, I know you’re thinking: “why should we like moths?” Look at all the trouble they cause! Well, like all other insects, the pests are a tiny minority and the rest make up for it in so many different ways! So, a couple of them eat silk, but where do you think we get that silk to begin with?? The silkworm (bombyx mori) is the world’s only domesticated insect. It is farmed for its silk and these little guys produce a ton of silk worth millions of dollars every year. They are not the only ones. There are several types of moths in the family Saturniidae (giant silk moths) that are used for their silk as well. What about pollination? Butterflies do well during the day, but there are so many night blooming flowers. Moths have those covered! Hawkmoths (a.k.a sphinx moths or hornworms) are lovely evening pollinators. 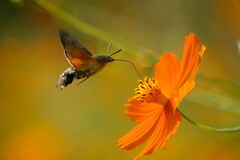 They are excellent fliers and some, like the hummingbird moth, are able to hover next to flowers to get nectar. They are often mistaken for hummingbirds. They are awesome to watch! You can plant a moon garden in conjunction with your butterfly garden to attract moths like these. They are attracted to flowers with white blooms that open or are most fragrant in the evening. One last thing to mention is the beauty of moths. 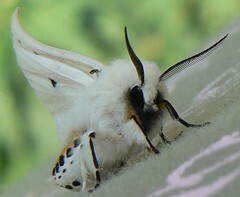 Everyone raves about butterflies, but some moths rival and depending on who you ask, surpass the beauty of butterflies. There are several breathtaking species of sphinx moths such as the Oleander Hawk Moth. All sphinx moths are known for their distinctive wing shape, very thick bodies and amazing flight capabilities. 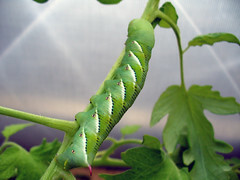 The larvae have a horn at the end of their abdomens during their earlier stages – giving rise to the name hornworm. Saturniids, or giant silk moths, are perhaps the most well known moths. They are very large with butterfly-like wings that often have eyespots and brilliant colors. Perhaps the most well known is the Luna Moth. They are a beautiful light green color with graceful, flowing tails. Even more amazing is its relative the Madagascan moon moth or Comet Moth. Some other common saturniids that can be found around here include the Cecropia, Polyphemus and Io moths. Unfortunately, these beautiful giants only live for a couple of days as adult moths. They emerge as adults with no mouth parts, so they do not feed. They live off of food stored from their caterpillar stage until they find a mate and then they die. We do display a species of giant silk moth here at the Cockrell Butterfly Center, the Atlas Moth from Southeast Asia. This is actually the largest moth species in the world and it is amazing! Finally, there is the Uraniidae, the family that includes the world’s most beautiful lepidopteran, according to some. This family contains several beautiful and colorful moths but the most famous is the Madagascan Sunset Moth. They were originally grouped together with swallowtail butterflies until 50 years after its discovery. I’m not sure if it’s the prettiest, but it is certainly a sight to see! Whether they’re large and colorful or small and cryptic, I think moths are fascinating and beautiful insects that are just as important as any other beneficial insect. Next time you see one resting during the day, take a closer look. You may be surprised to see the intricate shapes and patterns that make up its “drab” camouflage. Until next time, happy bug watching! I love this website…. PLZZZ keep it up ,, it is a blessing,, And I am ALWAYS looking for informative sites like these i love nature! It’s Gods love intrically designed in the pattern of Their wings.. THANX! That’s wonderful Mary Smith! I think appreciating the small things like insects, helps us to appreciate nature in all forms. I’m sure your garden is a great habitat! Keep it up and thank you for reading!